I wrote a recent post about a workshop in Berlin the other week, and promised a follow-up about the project we developed there. I started writing that post, but then realised that the context – specifically, insights into Deaf culture and experience, on which a good part of the project rests – deserve an entire post by itself. So here you go. It feels like I’m exploring a vast new world I barely knew existed before a couple of weeks ago. The points below come from conversations with Deaf (and culturally Deaf) people, and my own subsequent research. Some issues are sensitive, and I try to engage respectfully and be aware of my ‘hearing privilege’ as I write this - but if there’s anything which should be corrected or represented differently, please do leave a comment. Starting with the obvious: sign languages are complete languages, just as rich in meaning and nuance as any other. They have different grammar and structure from ‘hearing’ languages like English. It makes me realise how much the structure of English and ideas of what constitutes ‘good style’ is informed by what sounds good. Puns in English are of little interest to Deaf people, though there are such things as sign language puns and rhymes, which are visual in nature (a little like pictographic puns in Chinese). Sign languages developed organically, from isolated communities in the pre-Internet age. So for a Deaf person the linguistic map of the world looks a little different: ASL (American Sign Language) is a different language from BSL (British Sign Language) and AusLang, which is used in Australia. If you're Deaf, these three countries speak different languages. The meaning of a sign is literally affected by the emotion in the face and body language of the signer. A 'rough table' is given by the same sign as 'table', but with added 'roughness' in the movements and a correspondingly gnarly facial expression. This is exactly analogous to spoken English being given layers of meaning by intonation (sarcasm etc) - only more so. Many Deaf people learn to sign before they can write, just as hearing children learn to speak first. A spoken/written language like English is often a Deaf person’s second language and would therefore be less fluent with a smaller vocabulary than their native sign language. Compounded by education inequality, this means that Deaf people are more likely to have a lower English reading age than an equivalent hearing person and statistically have lower literacy rates. Nyle DiMarco: advocate, ambassador, eye candy. Being Deaf is not the same as being deaf. Capital-D Deaf refers to a person who is culturally Deaf as well as biologically deaf. Someone who was born with hearing, before becoming deaf later, is not necessarily Deaf. Deaf people are proud of their identity and participation in Deaf culture. Being Deaf is not necessarily seen as a disability by Deaf people: it’s just a different way of experiencing life (although there are difficulties when trying to navigate a world built and administered by often ignorant hearing people). And just as a person who becomes deaf in later life is not necessarily Deaf, it is possible for a hearing person to be ‘culturally Deaf’, i.e. to be an accepted participant in Deaf culture – for example, if they grew up signing with a Deaf parent and/or have Deaf friends. Deaf culture and norms vary, but there seem to be some common themes throughout many Deaf cultures and communities. Directness/sincerity is one of them - and it can be disarming to a hearing person used to padding out language with pleasantries! Deaf culture has its own celebrities and champions. Case in point: Nyle DiMarco (pictured), last (ever) winner of America's Next Top Model. He helps hearing people understand the struggles of Deaf people, and is a very visible role model for Deaf people and sexually fluid people everywhere. More in this interview. The identity and character of Deaf culture has also been shaped through its oppression by mainstream ‘hearing’ culture. This has ranged from the sadly misguided to the downright systematically evil. 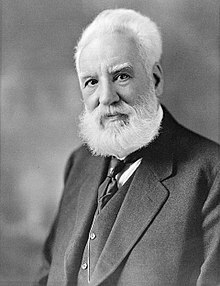 Alexander Graham Bell advocated for the abolition of sign languages (which is sort of like saying that Deaf children should be deprived of language) and he also opposed marriages between congenitally deaf people, for fear of “contaminating” the human race with “defective” people (wow... just wow.). Deaf people were given basically no say in how they were educated, and Deaf culture was frowned on and actively discouraged. It wasn’t until 1980 that Bell’s harmful views were publicly condemned. Even today the view of deaf people as less capable than hearing people is prevalent in many countries and cultures, and deaf people are still under-served, particularly in education and healthcare. There are lots of tragic stories still surfacing, and the picture is big and complex. AG Bell: bit of a douchebag, it turns out. Sign language gloves: no. Just... no. Fortunately, today, there is some technology available which enables Deaf people to communicate more easily with others. Smartphones and the internet have greatly improved access to services and information, as did the TTY ‘text-over-telephone’ system before. But more can and should be done. Technology to 'fix' congenital deafness such as cochlear implants is controversial. Given the proud tradition of Deaf culture, technologies like this feed into a debate about whether Deafness is cultural or pathological. For the signing community, apps that let users record videos hands-free (i.e. without holding down a button for the duration of the video) are favoured. Hence Glide is more popular with Deaf users than WhatsApp. Deaf people are not Beethoven: for a person who could never hear, vibration does not carry the same connotations as music does for a hearing person. Audio translated into vibration is often monotonous. The human tactile sense – even for sensitive tissue like the fingertips – is not capable of interpreting music in the same way as a hearing sense. (And no, Deaf people do not have spider-senses for vibration). Because a Deaf person depends on visual communication, visual clutter matters a lot - TV screens, bright advertisements, and the like - and difficult lighting conditions are exhausting to a signing person trying to understand someone else. for any new technology for Deaf people to have a hope of being effective and appropriate, Deaf people must participate in the design and prototyping process! The phrase Christine Sun Kim used is very apt: "nothing about us without us". Cardzilla - simple but useful app! In the next post I'll talk a bit about what we actually did with all this information.